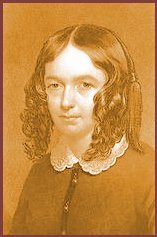 Elizabeth Barrett Browning is known principally as the author of Sonnets from the Portuguese, a series of love poems which has, over the past century and a half, become the most commonly printed book in English. But she wrote a great deal of other fine work, including the marvelously musical poem below, composed in 1855. And shut the sky and landscape from their view. The sunset consummation's lights of death. One guesses the following, which sounds rather pious at first, to have been startling to Browning's contemporaries with its sunny proclamation that pagan idols will be brought back in all their glory. New Memnons singing in the great God light.